We can use Wolfgang Van Goethe’s powerful message to motivate our individual journeys as artists and photographers. Our job is to move through our fear, and go after what calls, even when it means growing beyond what we initially imagined. Many recognize the value of surrendering to the creative flow, whether they are mathematicians, poets, athletes, musicians, dancers, or artists. According to Csikszentmihalyi, psychological theorist and researcher on positive energy flow, this creative “zone” engages active physical and/or mental activity. It can be recognized by attentive absorption in the task at hand, the irrelevance of time, and the experience of deep happiness and well- being while involved in the creative process.1 Watch a TED Talk by Mihaly Csikszenmihalyi on the ecstatic state of flow. 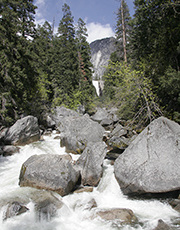 Also referred to metaphorically as a stream, discovering our creative flow takes time, practice, and perseverance. Fear and conditioned beliefs can keep anyone from exploring their desire to dream up something new. Also, our exploration can be blocked if a task is too easy or too challenging, and if access to instruction and resources are limited. Thus, we need to be open and find an environment which is rich with opportunity and support to allow our imaginative expression to unfold. As we follow our creative flow, it can expand to embrace a larger perspective on the entire art of living. The Tao Te Ching, a revered century’s old Chinese text written by Lao Tsu refers to “effortless effort” with an emphasis on attuning oneself to the universal flow as crucial in governing one’s life affairs. (Order a great translation of the Tao Te Ching by Stephen Mitchell.) Like Csiksentmihalyi’s theory, effortless effort is not passive. Rather it is an alert, highly disciplined and focused state, even when one outwardly appears to be doing nothing. Inherent in the process is a surrender to the way things are, beyond the way we think things should be. Ecstatic happiness is part of this experience. World famous adventure rock climber Alex Honnald is a maverick in his field. As a hard-working and gifted free ascent climber in the elite climbing community, he has practiced his athletic genius over many years. 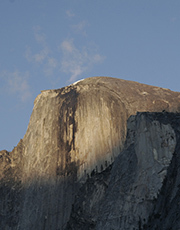 Like a gifted ballerina, Honnald scales the vertical dizzying walls of Half Dome in Yosemite, without a safety harness or ropes. His method of climbing seems mad to the rest of us, as any mistake could mean instant death. Yet, Honnald is surrendered to the creative flow. His climbing looks easy and effortless. He defies the usual climbing rules to explore his own territory. The towering rock face is his canvas and his athletic body the medium. Overcoming paralyzing thoughts of fear as a young boy climbing in the gym, Honnald reports no adrenaline rush as he climbs, just a mellow sense of flow. In fact, if he did experience adrenaline then he knows something is very wrong. 2 Visit Alex Honnald’s website to view amazing photography of him artfully reaching for the next handhold, with the valley floor plunging thousands of feet below. Though many do not possess expert climbing ability, nor the desire to scale high rock faces, his example can provide a valuable lesson to follow. Once I took a figure drawing class. We would start by sketching brief warm up exercises of the model who held a pose for a minute or so. It was challenging to capture the model’s gesture. We would progress to longer poses where we had more time to draw the figure and the light. Initially I was frustrated with the lines and shapes on my sketch pad. I would glance at my classmates work, and admire their talent. In time a curious experience occurred–the sketch began drawing itself! I was amazed. It was magic. I liked what I drew. This process was repeated in successive classes. It occurred after those challenging warm- up gesture drawings, and always after I experienced a threshold of frustration with my drawing skills. It seems that the more we challenge ourselves appropriately, the more we can attune ourselves to this stream, and the more the flow can move through us, according to Debbie Purdy, facilitator of process painting workshops. Those who align their lives with flow, experience an ever expansive sense of unity, happiness, and confidence. As this sense multiplies we discover a wonderful sense of co-creation or synchronicity with the universe. A pretty cool resource!